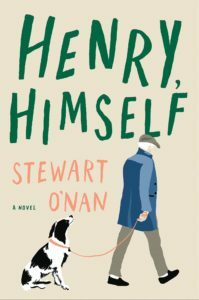 Returning to the fictional Maxwell family of Pittsburg, Stewart O’Nan’s Henry, Himself provides the backstory for two of the author’s previous, highly appreciated novels. The first, Wish You Were Here (2002), introduced the family following the death of Henry, the protagonist of the present volume. Nine years later, in Emily, Alone (2011), Emily learns to cope as a widow and discovers new levels of strength and independence. Each novel is a warm, touching appreciation of realistic family dynamics. His mind begins to slip away from him in myriad ways. He forgets a stop sign and nearly plows into a school bus filled with children. He goes to the grocery store only to realize he has brought the wrong coupon for the item he wanted, and on the same trip, forgets to buy the windshield wipers he really needed. On a trip to Home Depot, he tries to recall his shopping list: “propane and Drano and what, propane and Drano and what.” These harbingers of the slow slippage of his mind are quietly conveyed by O’Nan, whose characterization of Henry is both sweetly poignant and vividly, honestly realistic. O’Nan is a master of balancing the fine line between a tender appreciation of Henry and Emily’s lives with a faithful demonstration of what it means to get old. Do not mistake “tender” for a saccharine story of an aging couple, however. They are very real, very honest in all their warts and foibles. Their children are not perfect and, even in adulthood, still burden their parents. Henry, Himself is a perfect complement to the trilogy’s other two novels. Those who have read them can now discover the genesis of those two stories, while others can now read them in chronological order and appreciate the world O’Nan has created. It is a world of truth and obfuscation, anger and laughter. This is a novel of beautifully written prose, both lighthearted and deeply serious.